Jewelers use many different methods to create your diamond engagement and wedding ring. While all of these are perfectly acceptable, some may be preferable to others. Which diamond engagement ring is right for you? Some wedding rings are manufactured from wire stock. The jeweler will take a pre-cut length of wire, usually half round (a "D" shape profile) or flat (a rectangular profile) stock. The wire will then be formed around a ring mandrel to the required size, and the two ends soldered together. By filing and polishing, the diamond engagement ring will then be finished to sale quality. At this point, it will be almost impossible to see the solder join. While there is nothing wrong with this type of ring, eventually the solder join will become visible because solders tend to tarnish at a much faster rate than karat gold alloys. At Danforth Diamond, all our wedding rings are manufactured from cold worked tube, making them seamless and solder-joint-free. Ring "blanks" are cut from a long length of tube, machined to size and profiled to suit your request. Not only does this type of diamond engagement ring wear better with time, offering greatly improved tarnish resistance over the soldered type, with no joint, these rings are also a much stronger alternative. Start shopping our diamond engagement rings or wedding rings today. Investment Cast or Die Struck? There are two other manufacturing methods used to make jewelry. These are investment casting and die striking. This is a method that has been used by jewelers for millennia. It involves taking a wax model of the ring style you have chosen and encasing it in an "investment" - like a high temperature plaster of paris. Once dry, the investment mould has the wax removed by "burning out" in an oven, and is then heated to a temperature suitable for liquid metal to be introduced. The jeweler then melts a charge of karat gold or platinum, and forces it into the cavity, reproducing your chosen ring. Die striking is somewhat different. Typically, a billet of metal is cast and reduced in size by rolling. The required final shape is "struck" in a die, using the same basic process as striking a coin. If the die has polished surfaces, then the part produced will have a polished finish also. 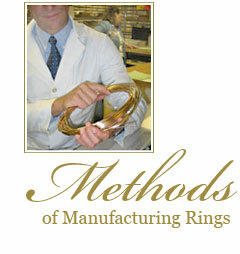 Which is the Best Ring Manufacturing Method? Although it can be argued that die struck rings have a superior metal "structure" with zero porosity and defects, not all shapes and designs can be made in this way. It is also relatively expensive for the jeweler to produce dies to do this. Investment casting allows the jeweler flexibility to make complex designs, but the process can result in rings that contain some porosity and also the component may not be as dimensionally accurate as the equivalent die striking. In reality, neither method of manufacturing jewelry fares better than the other, it just depends what you want. What Ring Manufacturing Method Does Danforth Diamond Use? Danforth Diamond uses die struck components to manufacture wedding rings wherever possible, and also uses investment cast components to bring the most intricate designs to you. So at Danforth Diamond, you get the best of both worlds.